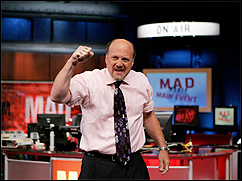 NEW YORK (CelebrityAccess MediaWire) — Spastic Mad Money stock analyst Jim Cramer has upgraded his recommendation on Live Nation stock from a sell to a hold on his blog, TheStreet.com. Cramer mentioned that Live Nation’s revenue grew more than 39% in 2006 and appears to have helped to boost earnings per share. Cramer expects even more share growth in the near future.